Everyday stress can have a negative impact on training, but if you learn to work with it you can use it to your advantage. The body doesn’t know miles. It knows stress. Adjust your training based on stress and don’t mimic the training of someone living a different life. Those words are simple to say, but are hard to understand, let alone put into practice. What do we mean when we say “stress” in the context of running? There are two main components: musculoskeletal and systemic. Musculoskeletal stress is the breakdown of muscles, tendons and even bones that occur when you run. A little breakdown can do a lot of good—the body builds itself back stronger. But push a bit too hard, and a bit too long, and those small cracks can cause everything to shatter in the form of overuse injuries. Running also causes the adrenal glands to release a stress hormone called cortisol, causing what I call systemic stress. Cortisol increases at the onset of exercise in order to help regulate glucose concentration in the blood, allowing the body to burn energy efficiently. A little bit of cortisol is necessary. But too much leads to a progression of maladies. Think of your cortisol reserves like a reservoir: it may be full during hard training, but if the dam floods it can cause major destruction. Stress overload starts with decreased performance. You’ll often notice the symptoms in everyday life before you notice them in your running. For example: abnormal fatigue walking up stairs, disrupted sleep cycles, or legs that involuntarily clench while sleeping. Keep pushing, and the body can essentially shut down as a defense mechanism, culminating in complex issues like adrenal fatigue and overtraining syndrome. That said, in order for the body to adapt, it needs to be stressed. So when we are talking about how to structure your training, we are essentially talking about how to distribute stress in a sustainable way. Not everyone responds to training stress in the same way. One of the athletes I coach recently ran 15 miles at 5:40-minute mile pace at an aerobic heart rate of 150 beats per minute (BPM). For his body, that is a swift jog, and doesn’t cause much breakdown or cortisol release. Meanwhile, I have other athletes running 10-minute mile pace at a heart rate of 175 BPM. These runners’ cortisol is flowing freely even though they are not running as fast. Why? Every body has a different threshold for stress. 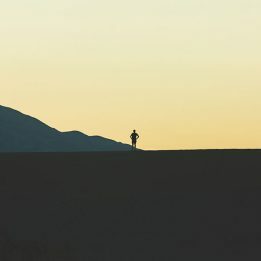 Moreover, running isn’t the only activity that causes your body to release cortisol: a contentious meeting or hectic day at the office releases cortisol just the same as running hard up a mountain. When it comes to systemic stress, the body considers miles run right alongside meetings managed, children fed and protests marched. Therein lies the problem with trying to mimic someone else’s training: that professional runner you follow on Strava may be setting aside two hours for napping each day, while you may only have two minutes to yourself when the kids finally start napping. So for those stressed-out, motivated runners out there, here are 4 tips to use all sources of stress to your advantage. The first tip is the most obvious: you must adapt your running to meet the realities of your life. For example, 60 miles per week is different for someone like me working from home with a dog than it is for someone commuting an hour to work, with kiddos at home. Even if we have the same exact fitness level, our daily stress levels are different. The busy parent might need to reduce training to 40 miles per week for the same total stress that I achieve in 60 miles. Never compare your training to people living different lives—it is unfair to yourself, and unfair to your adrenal glands. In practice, you (and your coach, if applicable) need to flow with the contours of life. Make sure your training plan is complementary to your life plan, or you’ll end up shorting yourself in both. The only way to do this is to start at a safe volume, with minimal intensity. Increase the volume progressively before adding hard workouts—many coaches advocate for no more than a 10 percent increase each week. Remember, though: different bodies respond to stress differently. For many runners, fatigue is not an issue of inadequate mental toughness or unwillingness to suffer, but being so mentally tough that you suffer too much. Listen to your body, and always be willing to adjust when needed. Taking just one rest day each week automatically builds 7.5 weeks of healing into your training each year. Over time, rest days can be a prophylaxis against stress-related injuries and burnout. Most of my athletes use Monday as a rest day (unless it’s a holiday from work). However, a great option for busy people with less predictable schedules is to have a flex rest option. With flex rest, you are required to take one day off each week, but you mix it up based on which day would alleviate life stress the best. There is no better cortisol-reduction method than sleeping an extra hour or two. Fueling is one of the simple ways to control how the body reacts to stress stimulus. Chronic underfueling can cause big spikes in cortisol, leading to symptoms of overtraining, and sometimes long-term health issues. Try to get into a food routine that optimizes health. For runners that are training hard, that means erring on the side of overfueling. All of my athletes have “Burger Sunday,” or the vegetarian equivalent. Forget about the stigma of “unhealthy” food, since almost all food is good food when compared with the negative side effects of under-fueling. Be sure you are on top of your iron intake as well—many runners are training through iron deficiencies that hurt performance long before they are classified as anemic. Almost all of the female runners I coach (and many of the men) take an iron supplement. The same goes for Vitamin D.
Life is unavoidably stressful at times. However, training doesn’t have to be. You can reach your running potential without track intervals or a GPS watch. First, do most runs at an effort that seems easy, and take pride in running slowly. 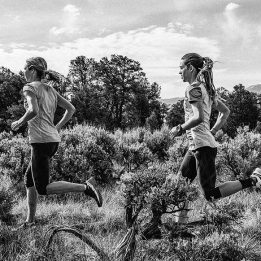 Training mostly slow and racing much faster is the hallmark of a good training plan. Second, include one workout a week (two at most) doing fartlek-style intervals, rather than distance-based intervals— 10 x 90-second intervals instead of 10 x 400-meter intervals—to avoid self-judging based on pace. Third, and most importantly: relax and remember to enjoy the process. As the great scholar Ferris Bueller once said, “life moves pretty fast. If you don’t stop and look around once in a while, you could miss it.” The goal of training should never be to run the fastest time you can, nor to reach some arbitrary goal, but to have experiences, make memories and love the moment. The Bueller-philosophy was my wife, Megan’s idea. She is a pro runner and full-time medical student. That is: she’s busy. Over time, we have learned that she needs to reduce her training by 10-20 percent while working (from 90 miles per week to 70-80), with just one focused workout each week, rather than two. She always takes a rest day, and she is never far from a healthy, high-calorie and nutrient-dense snack. 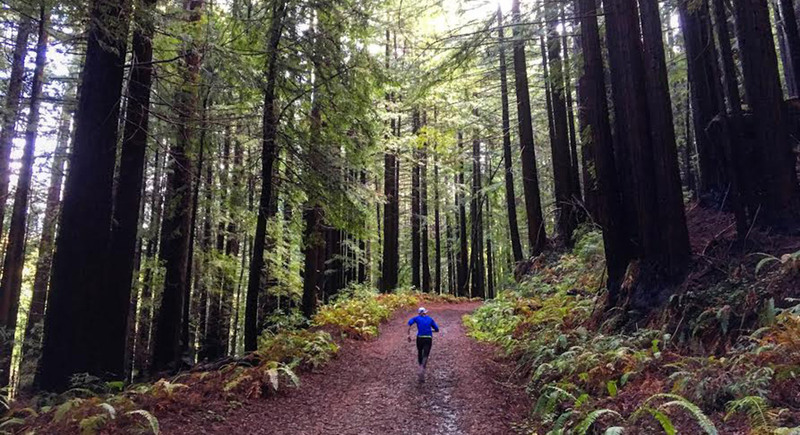 This past Sunday, we went for an ambling 15-mile run through redwood trees near our California home. Her training goal wasn’t to get any particular physiological adaptation, but to make a fun video of our dog that we’d have to laugh at for the coming week. 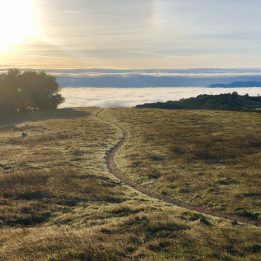 In a perfect world where training does happen in a vacuum, a pro like Megan may have done those 15 miles faster, with some hill strides and no stopping. But in the real world that isn’t always the best idea. I knew that we had made the right decision when we got back to the trailhead and she stopped, laughed and did a little dance. It looked like stress was the furthest thing from her mind. David Roche is a two-time USATF trail national champion, the 2014 U.S. Sub-Ultra Trail Runner of the Year and a runner for HOKA One One and Team Clif Bar. He works with runners of all abilities through his coaching service, Some Work, All Play. Follow David’s daily training on Strava here, and follow him on Twitter here. Thanks David! Obviously, I am not a doctor, just referring to the horrible blood profiles of overtrained athletes. Terminology matters less than prevention in this instance I think. But thanks for reading to that point anyway! Great article. I appreciate the fact that you address the realities of life and to take them into consideration when training. It is something I often forget to do and then wonder why my workout is less than satisfactory. It is a good reminder to remember to compensate for our everyday stress, and that everyone reacts differently to it. The first rule under “Reduce structure and self-judgment when it’s not needed” is so important I have found, especially in this world of Strava. Run slow to run fast. Thanks for the great tips. Thank you for sharing your experience and insight. I always tell people to have fun when they are running. If the running lifestyle becomes stressful of a source of anxiety over a missed run day or goal, back off and remember why you started. Thank you!! I’ve been dealing with a lot of life stress while training for a marathon so I’ve had to be very flexible in my training. It’s nice to see that validated here and to remind myself that a loose training plan is completely ok!